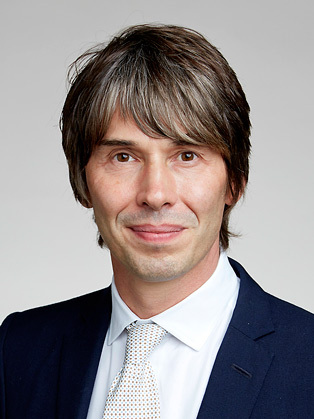 Professor Brain Cox’s blockbuster TV shows include Wonders of the Universe, Wonders Life, and Forces of Nature, each looking at the fundamental science behind everything from stars and planets to atoms and microbiology. He has also presented Stargazing, Space Hoppers, The Big Bang and numerous editions of Horizon. His books accompanying the Wonders of... series have become huge bestsellers, as did his co-authored titles Why Does E=mc2? and The Quantum Universe. An International Fellow of the Explorers Club Brian was awarded the prestigious Lord Kelvin Award for his work in promoting science to all. When not filming around the world, Brian writes for a range of newspapers and journals and co-hosts Radio 4's Infinite Monkey Cage, the comedy and science programme. He and his friend and co-host Robin Ince examine the big and not-so-big science questions alongside comedians, scientists and celebrities both on air and on tour. Brian also serves as the Royal Society’s Professor for Public Engagement in Science.